I do not know why it took so long to release the first Star Trek movie on DVD. All other Star Trek Movies are already around on DVD for quite a while. I can only guess. Okay, there is not much action, but the story is compelling. I do not know why most of the people always think about galactic battles, when they think about a Sci-Fi Movie. The best Sci-Fi Stories are about People, Society and Mankind (like Arthur C. Clarkes's "2001:A Space Odyssey", "2010:The year we make contact", Wolfgang Petersons "Enemy Mine" and Carl Sagan's "Contact"). I would have given the movie 5 stars, but the acting was a bit poor in some of the scenes. I think this movie is not just for Star Trek fans, "Trekkies or Trekkers". I think this movie is something for everyone, who is not a pure action freak and wants to think about a movie and its messages. Star Trek: The Motion Picture isn't perfect. Sure, it has all the cast from the TV Show. Sure, there are action scenes (albeit a few). But, the first of the Trek movies isn't that good. Don't get me wrong. I think the cast did a pretty good job. It's the story that is boring. Not to mention that 10-minute blackness of music at the beginning..I found that boring. This movie has been a mixed bag for Trekkies. The first "Star Trek" film. When I first saw this as a little kid, I hated it. But that was just because I saw a very, and I mean very, heavily edited version on TV that cut out almost all of the good parts and a great deal of the important parts too, so I wasn't only bored, I was completely lost. Then I bought the DVD years latter, and I actually enjoyed it very much. The only let down to this movie is that it's almost an exact copy-cat of the original series' episode "The Changeling". You think the writers could have came up with something new instead of reusing old ideas. But other than that it was very good. And one thing that pisses me off about the DVD release is that it does not work right on all DVD players. Luckily I have three DVD players in my house, and two out of the three work for this DVD. Everyone seems hyped up about the new f/x and such; but my issue with STTMP is that our most revered characters are relegated to second-tier status. The plot is an obvious rehash of "Where No Man Has Gone Before" with a misguided attempt to thrust new unknown characters into the lead roles. HUGE mistake. Thankfully WRATH OF KHAN corrected all that, and saved TREK from franchise oblivion. STTMP actually works better if you think of it as the LAST in the series, rather than the first. I think this movie is old enough now that if you are buyng it, you know what you are getting. As an editorial review I find this version as close to the original as I have found with better effects. There were lines I remembered as a kid that I was starting to think I dreamt up since I never heard them again until this version. Star Trek the Motion Picture is fundamentally ok. I don't regard it as the great reprisal of Star Trek. There are a few areas where this film fails. First, it is has a feeling of being overally romantic, and second, the lavish production was better than the storyline and characters. Just as an example for the overly romanticism here, The Ship, although redesigned effectively here, is shot too many times. I agree that the Scotty and Kirk sequence around the ship was just entirely too long. When you put this in perspective that the series had been off the air 10-11 years at this point, perhaps this was to serve as it's re-incarnation, but it was shot too long. My Feeling on Roddenberry is that he was good with casting and with writing, but he was not a producer and never was. He produced this movie and it feels he tried to reach for something but never made it there. Spock's character is something un-recognizable when he returns. His familiarity seems gone. Kirk and McCoy's dialog is weak as well. I don't believe movie captured the relationship well betweek McCoy, Kirk and Spock at all. (They later came back to it in the Wrath of Kahn, and by That Time, Roddenberry was not involved except for exec producer. Harve Bennett saved the movie franchise from that point on along with direction from Nicholas Meyer and Leonard Nimoy). #1 The transfer is about B+, the film print needs some clean-up & restore in places. The 5.1 Soundtrack is awesome. #2 The special features disc was OK, but I would have prefered to be able to watch the movie in the 3 ways that it could've been done. One option for the theatrical version, another of the 1983 TV version & the final being the Director's Cut. The outtake footage was neat to see, but again I know this Memory Wall sequence was filmed & should have been included in the set along with the short cut of the bridge security guard being zapped by the energy light probe. It would've been cool to have the memory wall scene finished up with CG & another option to watch it within the director's cut in place of Spock's Solo journey into V'ger. Oh well maybe on the future HD-DVD release. I wouldn't have to think for even a second about buying another release of this movie if that could happen! The featurettes on the disc have very enjoyable stories about on this film came to be. The movie commentaries are also very good. The behind the scenes on the Director's Cut was also interesting in describing the way the new CG shots were carefully matched to the original film. #3 The Enterprise in the dry dock getting ready to leave is my favorite shot of the movie & the Kiligons attacking V'ger is also really wicked! I would have loved to see this on the big screen! Kirk is so serious, Spock so cold & Bones as cranky as ever! The alternate take of these characters is so fun to watch. Overall I think this set is excellent, but I have to subtract at least one star because of the missing scenes that I was hoping to see finally would be on this edition sadly weren't. I realize that the movie is very old, but it is not impossible to restore the picture to near perfect condition like the Star Wars Ep IV-VI. I think that this movie deserves the full deluxe treatment for the HD release!!! That goes for The Wrath of Khan movie too!!! The first good thing about Star Trek I is the fact all of the actors are as close to the age that you remember them being in the original series as they can be. The Shat's rug might look a little obvious, but he looks like Jim Kirk should look at this point in his career. Nimoy and Kelly still look capable of saving the universe. Even Doohan is svelte in this one. The second good thing about Star Trek I is the Enterprise glamour shot. Scotty and Kirk's lengthy flight around the refitted and cooler looking NCC-1701 makes it worth owning this DVD. The third thing about this movie is that it resets the stage for further adventures. While not the best of the bunch, it wasn't the worst (that would be either III or V, depending on who you talk to). Though lacking in specifics about where they actually drifted off to after the five year mission, this one brings them back into the same room and gets the ball rolling for the rest of the movies. It's a rehashed original series episode, but like the old show, it tries to tell an interesting tale and make a few statements along the way. What's wrong with it? Nothing says lazy writing like the overlong special effects shots of the Enterprise flying through the unknown entity. And the dramatic conflict between the Enterprise's new, inexperienced Captain and Jim "I've saved the Universe a couple dozen times before you were born" Kirk that should have never occurred. I mean really, at this point in Starfleet history, Kirk and his crew would have been interstellar heroes and celebrities, legends in their own day. Captain Decker's whiney, insubordinate behavior is just there because this "G" rated movie didn't have enough dramatic conflict. Of the bunch, I'd say this is the fourth best of the films. Wrath of Khan is the most fun, Voyage Home the coolest and funniest, and Undiscovered Country the closest to what the original series was trying to do. But they wouldn't have been as good if it weren't for number one. Since at least 3 versions of this have now been seen, one would hope that the DVD medium would have allowed viewers to select their preferred version or to at least view a combined version of all finished footage from the previous releases. Instead, footage from previous versions (unless used in this re-edit) is packed onto disc 2, where it can't be easily viewed in conjunction with the feature itself. What a pain! The revised feature, accompanied by interesting commentaries, is solid, and does actually improve some elements of the story, as well as individual scenes. However, some tidbits of good dialogue are notably absent. One would have thought that this version would have enhanced character interaction by including more new dialogue, but that's to be found on disc 2. The 136 minutes includes an "overture" - 3 minutes of music before the opening titles or even the Paramount logo begin to run, and an additional minute of end credits for the "Director's Cut" which means that the film itself is still 132, just as the original has been listed in my film/video guides. Disc 2 analysis shows roughly 8 minutes of footage from the 1983 tv version left out of this new edition, and about 4 minutes of footage dropped from the original theatrical version, which suggests that those 4 minutes were replaced by selected scenes and takes from the 1983 version. The result plays quite decently, but for those of us who enjoyed the extra footage from different versions, we can no longer see that footage in place, and instead have to look in the disc 2 menus to find it. We must be grateful that it was included, however. Featurettes are also enjoyable, included on disc 2. 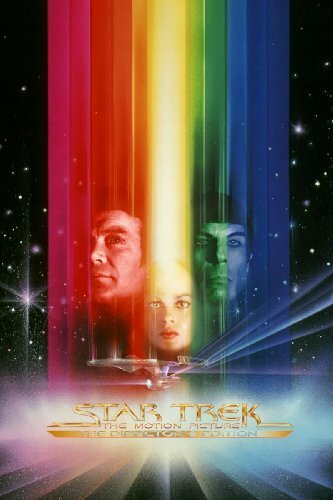 The Star Trek motion picture series should have began with Star Trek II: The Wrath of Khan. They should have never put out this disaster of a movie. I can't really think of any redeeming quality this film has except the fact it reunited the old Star Trek crew. It appears they just put together a lot of special effects, and then somewhere towards the end decided, "Hey, we probably need to have a story, too." I'm surprised this bomb of a film didn't kill off the entire franchise. The worst thing about The Motion Picture is the wait for such in anticlimactic ending. The grandiose music, the long, overblown introduction of the Enterprise, the overall epic feel of the film, all add up to a climax that falls flat on its face. You keep waiting for something interesting to happen and it just doesn't. I actually enjoyed Star Trek V more than this one, even though Star Trek V is widely considered the weakest entry overall it at least has some interesting character development and moves a lot more briskly than this plodding piece does. This one should have been called "Slow Trek"
This movie is slow, slow, slow and very plotless, and yet every once in a while, I am drawn to watching it again. If you're a fan of 2001: A SPACE ODYSSEY (and I am, big time! ), then the special effects here are probably enough to keep you interested. Jerry Goldsmith's score is new, original and exciting (and later used for "The Next Generation"). Because this is not my favor TREK film, taping it off of HBO at a slow speed was good enough for me. I cannot comment on the DVD edition, although I've often found these director's editions to be a waste of space. There's a reason many of these lost scenes don't make it to the final print in the first place. By the way, Scotty has been officially "beamed up". We'll miss him. Aye. This one will only really satisfy the real fans, if even them. The story used here comes from a script that they had worked out for "Star Trek Phase II", the sequel series that Paramount considered producing in the seventies. As an episode in a long running series, it would have worked. In fact, it largely resembles the basic story for the original series episode "The Changeling" from the sixties. The bad thing, though, is that, in order to take a story from an episode and make it a 2hr+ movie, they added several long scenes of people waiting and looking at ... something. It's never clearly explained, though it's easier to understand the geometry of V'ger's ship in this Director's Cut, with better special effects. It doesn't help the slow plotting, but it eliminates a bit of the confusion. In the end, there are some classic Trek moments here and there, but you have to wade through this plodding movie to get to them. Basically, the best thing to come out of this movie is that it proved that people still had a desire for more Trek. It did monster business when it came out, but people soon realized it wasn't all they'd hoped. The studios wised up before making the next one, but they could see that there was a market. More specific to this DVD release, the special features are quite interesting if you like understanding how movies are made.